The word prefix is itself made up with two different words, ‘pre’, which means ‘before’ and ‘fix’, means to ‘attach’. Both of these words have originally coined from Latin vocabulary. Prefix is a letter or a group of letters that are added to the beginning of a word in order to change the meaning, such as, ‘unhappy’, ‘illegal’, and many more. You all are engaged in various ‘extracurricular’ activities in school; now lets’ break the word. ‘Extra’, which means ‘beyond’ sits before the word ‘curricular’, means subjects from school syllabus, and make a new word ‘extracurricular’, which means subjects beyond school syllabus. There are hundreds of prefixes we use every day. However, some common prefixes in English language are, ‘con’, ‘un’, ‘in’, ‘im’, ‘il’. Therefore, it is important to understand meaning of different prefixes to develop a strong vocabulary and master the language. Interestingly, many don’t know that a prefix can have more than one meaning and therefore you need to be careful while gaining knowledge about it. Never change in base word: Make sure you do not change the spelling of base word. Double letter can occur: While using prefixes, be careful about double letter words, such as immortal (im+mortal), illogical (il+logical), unnecessary (un+necessary). Look alike, but not prefix: There are numerous words in English vocabulary, which look like prefixes, but if you concentrate, you will find these are not prefixes in reality. Such as, in the word ‘real’, ‘re’ is not the prefix. 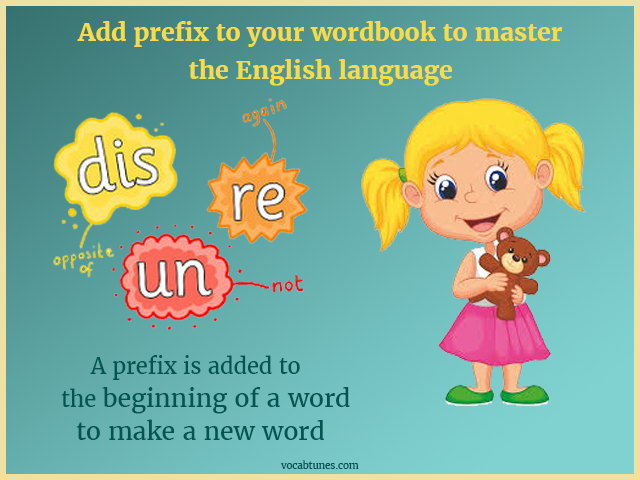 To learn more about prefixes, tune on to Vocab Tunes’ track here.